How a fallen tree lives on. Sometimes a much loved tree just has to go. Our old double trunk gum was much too close to the house. It was a definite fire-hazard, and also there were signs of white-ant activity. 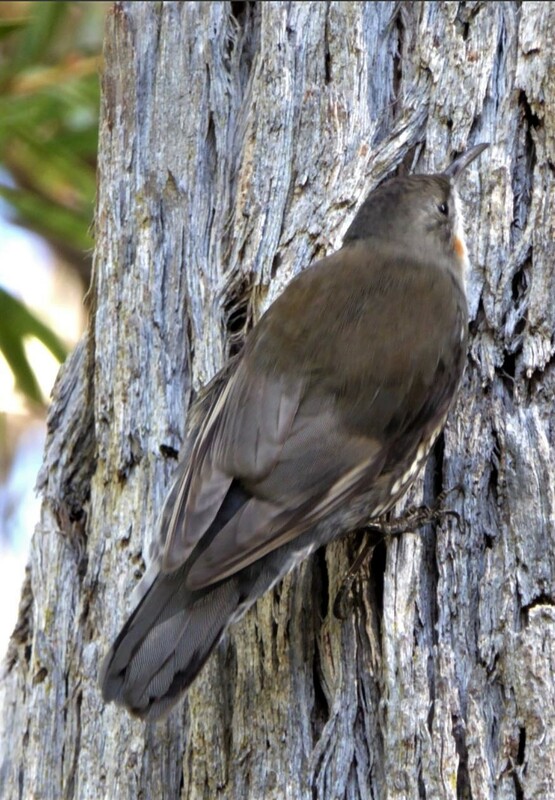 The tragedy was that many of our birds were fond of it too. 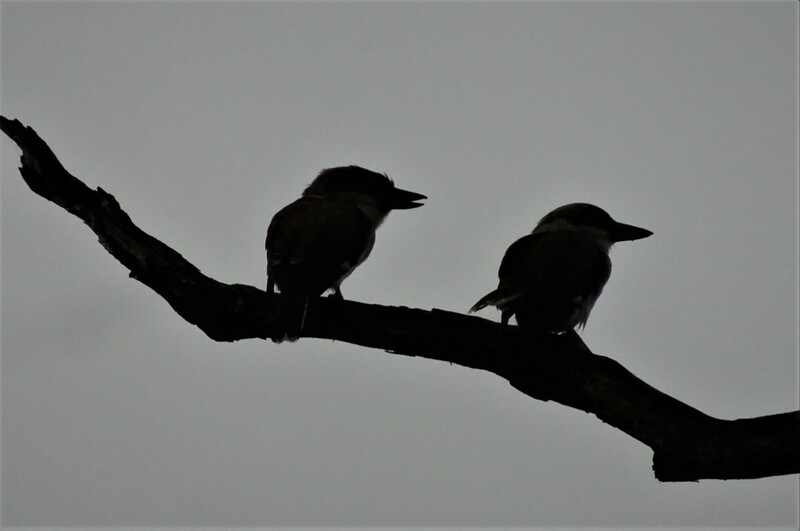 One dead limb was a regular perch for a pair of kookaburras at dawn and dusk. 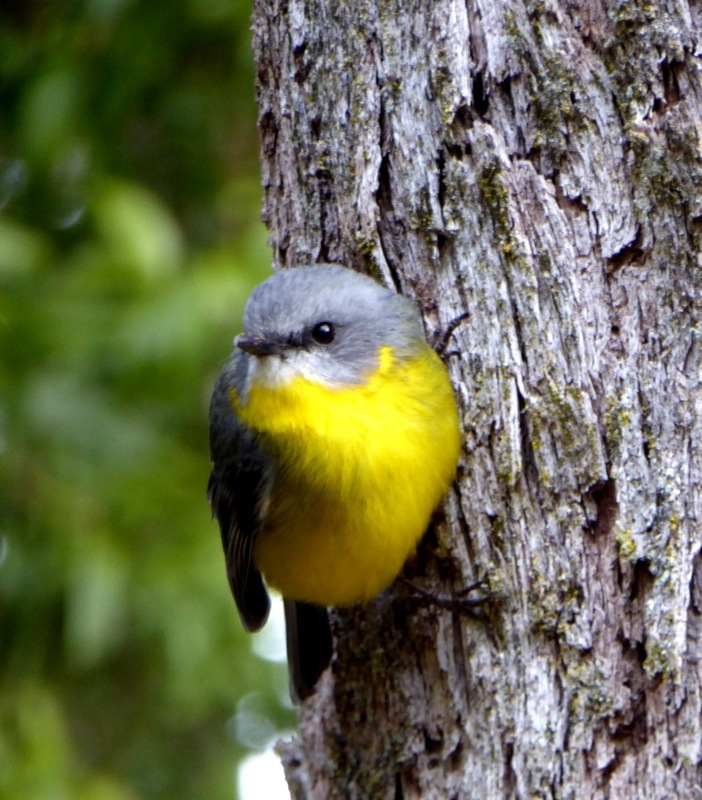 A favourite perch for the Eastern yellow robin. Dear me, it was awful watching as the men started to remove the branches. At least they did their best to avoid damage to the garden. 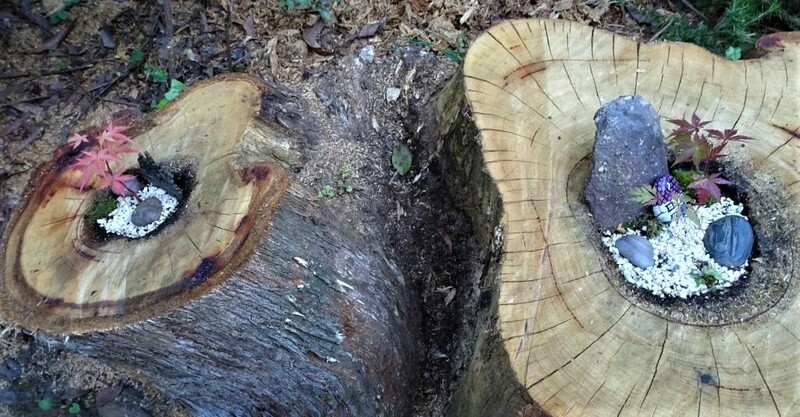 The remaining trunk was chainsawed into ‘wheels’. 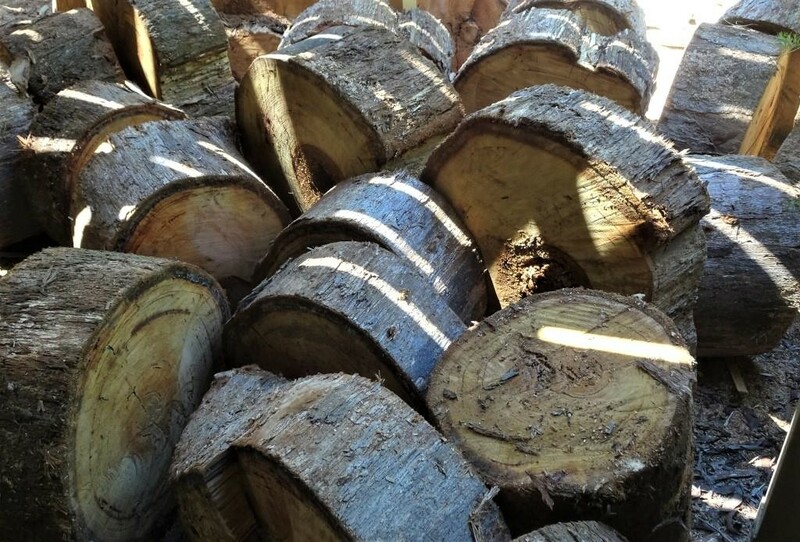 They will be seasoned and used as firewood for our two stoves. I can see my trusty splitter being put to good use. I might save a couple of blocks to use as rustic garden seats, or pot stands. Warm fires for us next winter. 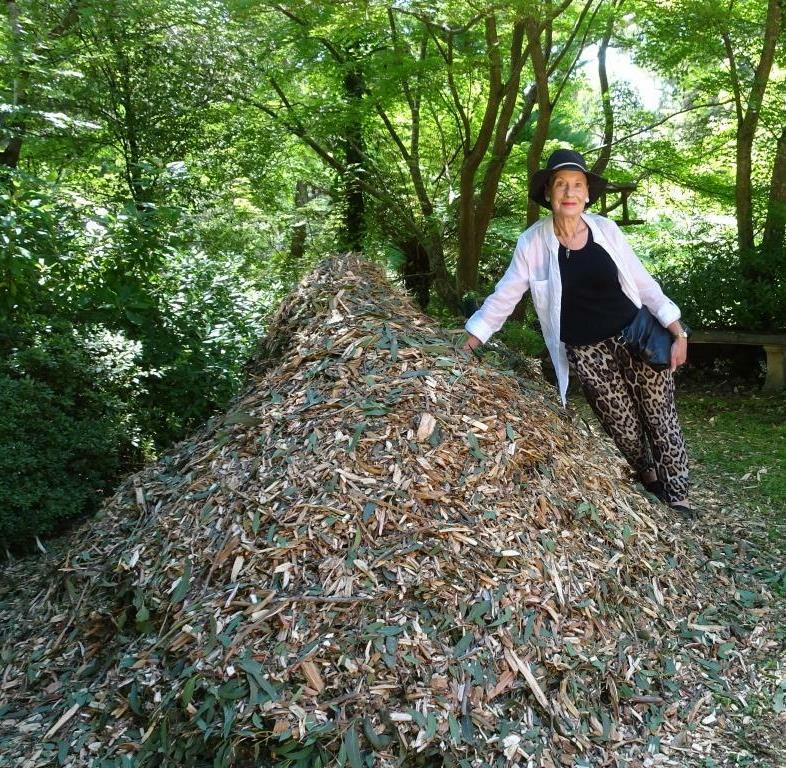 The thin branches were put through a giant chipper. It was very, very different to our own tiny machine. My poor little lawn almost disappeared under the resulting pile of chips. Quite a lot of tree here. 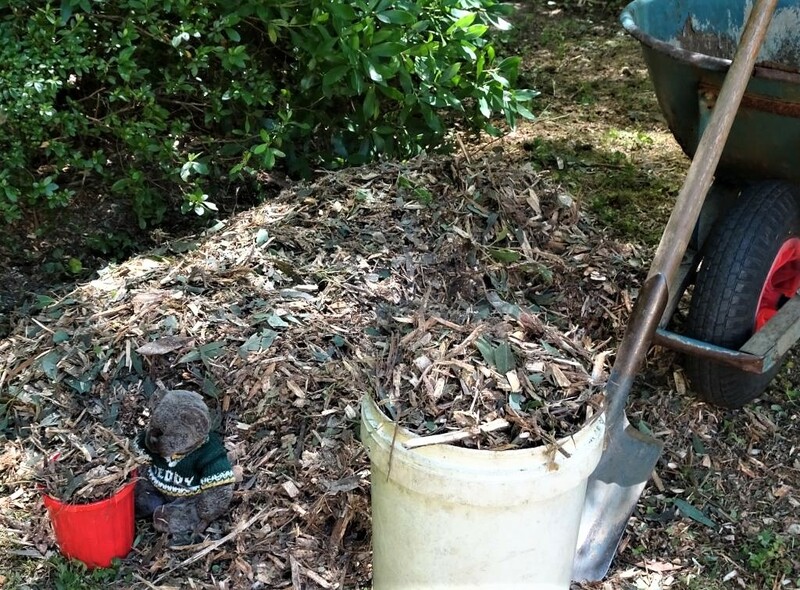 Eventually the mulch was used on our woodland paths. Even my young associate Editor Des helped spread it. So now we were left with the double stump. It could have been ground out, but we decided to keep it as a sort of memorial. Hmm, what to do with it? I decided to dig out the rotted centres and plant something in them. Editor Des showed a lot of interest, but was unable to offer a single sensible suggestion (no surprise there!). What could we plant, Des? 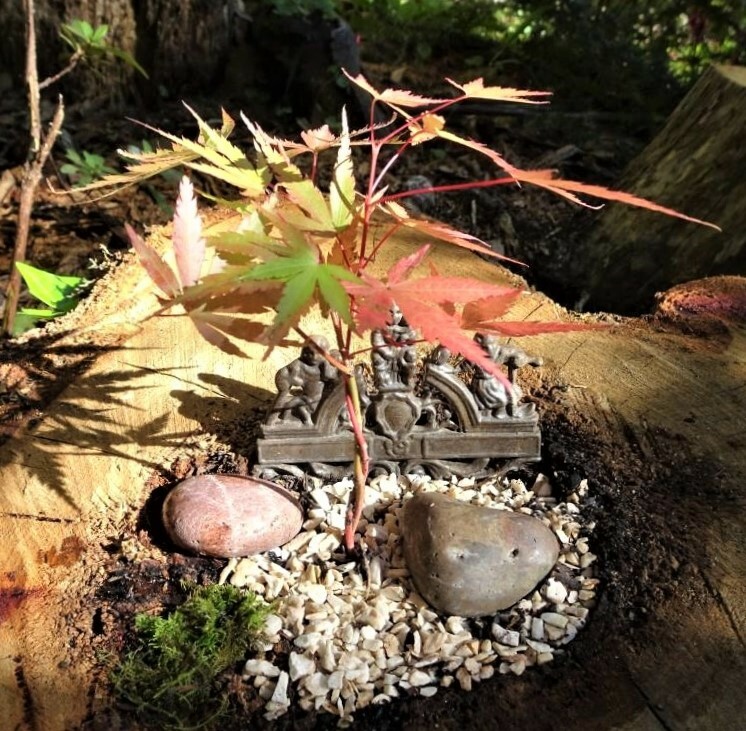 In the end I decided to use some of the countless self seeded maples we have, to create little bonsai gardens. 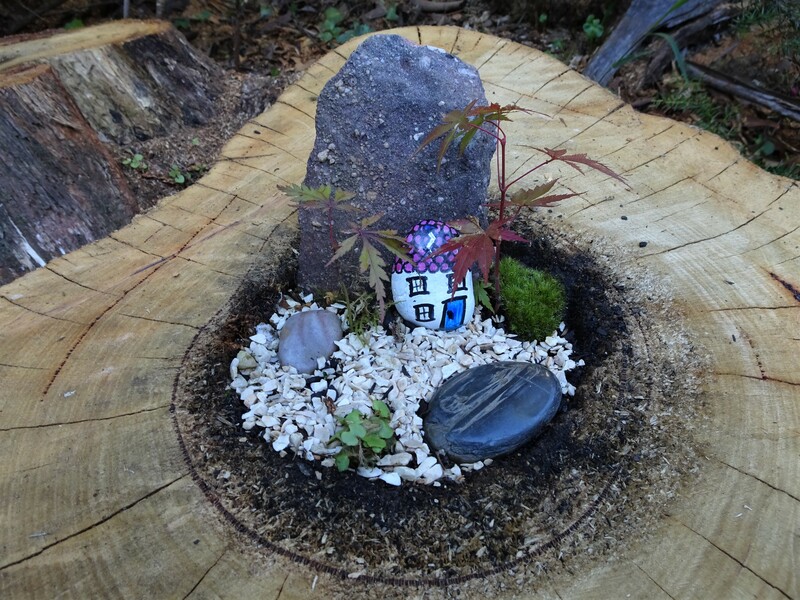 Tree stump bonsai garden. Do you like the twisted trunks? I just need some miniature figures to bring the gardens to life. There was a final, rather strange gift from nature. 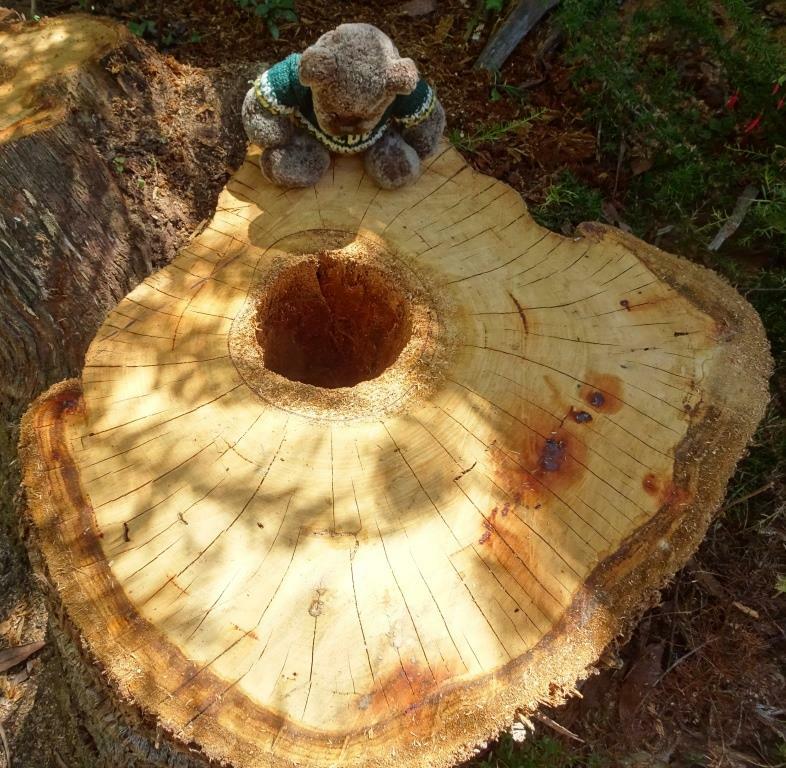 In the sawdust behind the stump there appeared a soft, bright yellow mass. 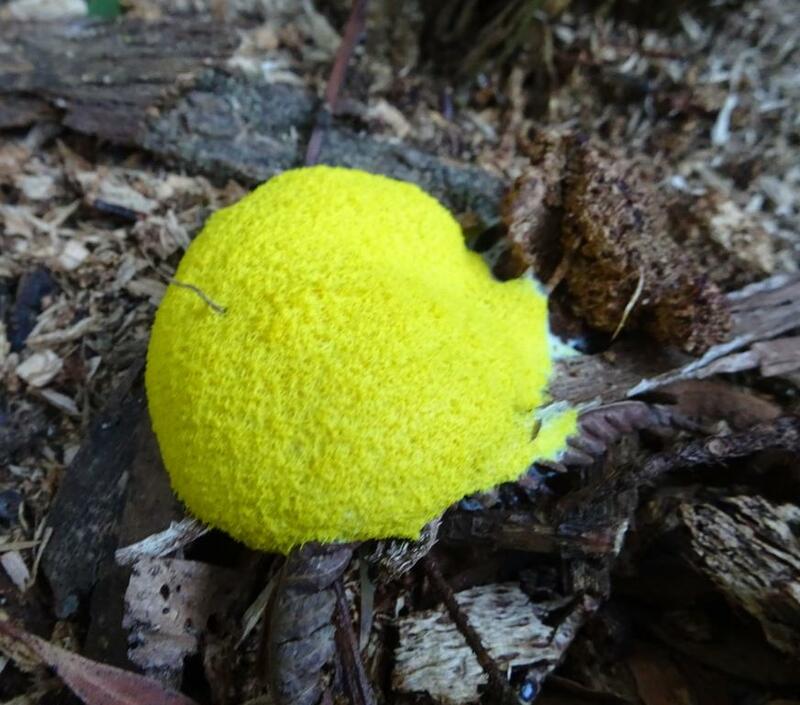 It was Fuligo septicai, commonly known as Scrambled Egg fungus or, wait for it….Dog’s Vomit. I don’t think I’ll be eating it on toast. 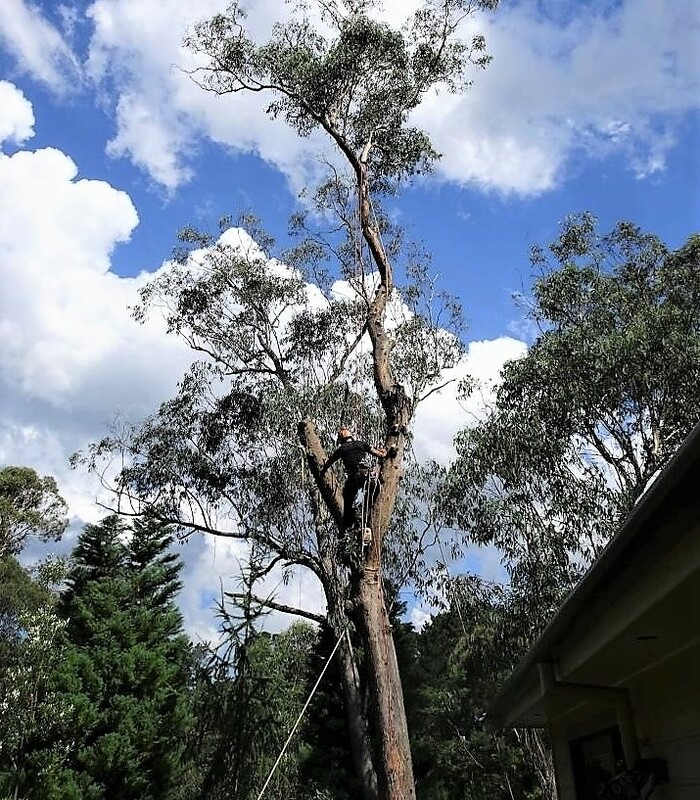 Farewell dear old eucalypt. You will be living on here in various forms for many a day.